Note that times are approximate but based on personal use - no timetables are shown at the bus stops nor is one published! Route diagram which DOES NOT SHOW the stops in Branqueira and Vale Navio. 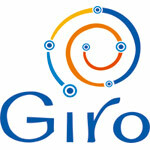 Click the GIRO logo below for a map of town with all routes - external links. X - these three stops are currently not being served owing to extensive roadworks. I do not know how long this will last. As a consequence they are often at the next stops about two minutes earlier than shown here. * close to Merlin's Bar and Vila Recife; short walk down into old town centre. * *the stop is outside the smaller Pingo Doce supermarket; note the bus does not stop here going in the opposite direction! ++ the stop in this direction is OUTSIDE the Bus Terminal across the road by the pedestrian crossing. About 30 metres to walk. ¤ the official posters refer to this stop as 'Rotunda da Esfera Amilar'. The stops are on the Branqueira side outside the school. Vale Navio ¶ - there is only one bus stop, near the junction, all buses stop there from and to the town. § the official posters refer to this stop as 'Rotunda das Relógios´(Watches roundabout). From Branqueira etc, this is the nearest stop to the old town 6 / 7 minutes walk. No bus connection towards old town. Coming back up the hill, Linha Verde will bring you to this stop.